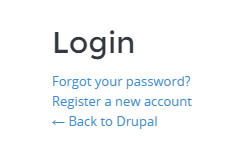 On Drupal 7, you suddenly experience a login user page being redirected to a non-working or blank page at /user/login?destination=user. On below example, you notice the login form will not work as no form fields are being displayed. Even on source code, the same form fields are missing. On above issue, the culprit seems to be a conflict with the Betterlogin module. Disabling the betterlogin module worked.